Distance from Bangalore: 158 km. KSRTC bus timings: 7 am and 11.45 am. Friday Jun 29th, 10.45 pm, yet another boring weekend was on the cards. Suddenly Jatin pinged me on google talk. me: how many people ? me: at what time u are leaving ? Since there was no concrete plans for the weekend, I confirmed my participation to Jatin within 10 minutes. Immediately I put my camera batteries to charge and got cleared all my queries from Jatin. The other person on board was Rohith(Jatin’s cousin), with whom I had been to 'Ombattu Gudde' and Savandurga. Next day I got up at 5 am ( 1 hr earlier than weekdays). As per plan, I was in front of KSRTC stand enquiry counter at 6.45 am. When I called up Jatin, he said it will take around 10 minutes. Rohith also said the same. The ‘7 am direct bus to Shravanabelagola was already at ‘5A’ platform. I requested conductor to hold on for some time saying my friends are on the way. 7.05 am Rohith came, but no signs of Jatin. The conductor ran out of patience and the bus departed immediately. The next direct bus was at 11.45 am. Rohith asked me to relax saying“hey we can go to taking bus Enroute to Hassan”. Then, we two had breakfast at the bus stand. As soon as we completed the breakfast Jatin came, we immeditely boarded bus to Hassan. We took tickets(Rs. 74 per head) till Chennarayapatna. 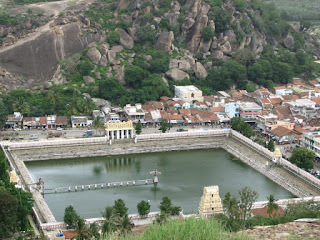 From Chennarayapatna we took local ksrtc bus to Shravanabelagola(Rs. 7 per head), reached the destination at 11.15 am. First we had dosa at Hotel Abhishek opposite to bus stand. Vindgyagiri, also known by name Doddabetta is one of the two major hills. 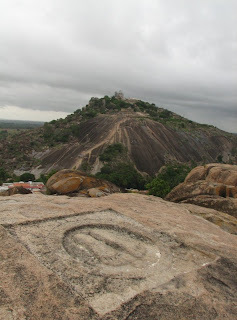 Atop there is world's largest monolith, statue of Bahubali (Gomteshwara). One has to ascend the hill using steps, bare foot(mandatory). While ascending we took photographs of downhill view which was dominated by Kalyani. The temporary structures made for 2006 Mahamastabhisheka were not yet dismantled. On the way there were many medival age inscriptions on the rock surface. These were preserved by covering with glass shield. Next to one of cluster of inscription was Tyaga Kambha. The carvings on this were very unique. 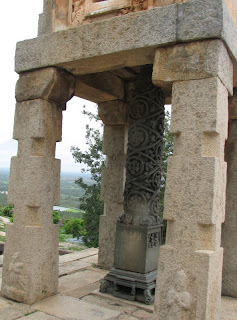 On lower part of the pillar there were inscriptions in Kannada. We ascended further to reach peak where Bahubali statue is situated. Around the statue there were series of 14 small idols of other thirthankaras called 'Suttalya'. We had darshan of Bahubali. There we had photo session here four about half an hour. I experimented with color swap mode of my S2 IS, by capturing statue in different colors. While descending we had photos of basadis which we skipped while ascending. Jatin took some macro shots with his Pentax SLR. At 3.45 pm we were at ground level. Jatin and Rohith did some shopping at one of fancy stores. Then we went to Sanmati Jain Bhojanalaya. The Rs. 30 meal was good. 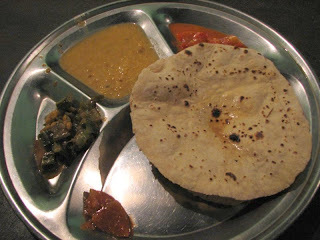 They served dhal, roti, play, rice, sambhar, buttermilk. None of the food items was prepared using onion, because many setus have food at this mess. After lunch we decided to ascend Chandragiri(Chikkabetta). I remember by history teacher( P. A. Kumar) saying that "Chandragupta Maurya had come this place renouncing his throne. He stayed on Chadragiri opposite to Bahubali statue hill". 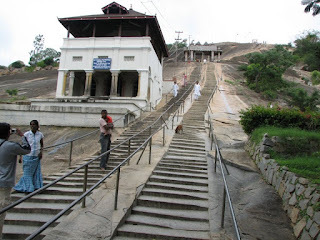 Atop chandragiri there are basadis of 14 tirthankaras. Of all of them Kattale Basti was very distinct because of its circumambulatory passage. I took photo of the basadi in 10 second exposure. Later we went to see cave and peak of chandragiri. After having brief photo session we descended. Footprints on Chandragiri peak, Vindhayagiri in background. At 6.30 pm there was no direct bus so waited for channarayapatna bus, which we got at 6.45 am. At Channrayapatna we didn’t even waited for 5 minutes for Bangalore bus. The journey was comfortable even though we were seated in last row, thanks to good condition of highway. Initial part of the journey we reviewed snaps in our cameras esp snaps in Jatin’s Pentax SLR. By10.30 pm we were back in Bangalore and concluded the trip by having badam milk at a stall in bus stand. Have a look at more snaps in picasa album. Good description man...I went there but did not go to chandragiri and also have not seen any glass sheild to protect the 'marathi' script found on the stones. Very informative post. 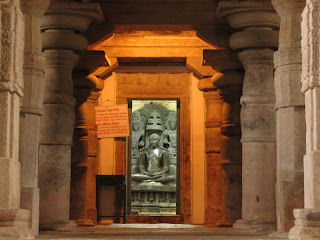 thanks for detailed information because i want to go Gomateshwara shravanabelagola, so it will help me. 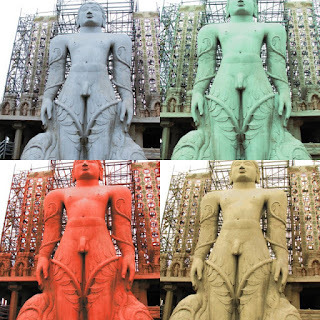 Gomateshwara is the tallest statue in the world. 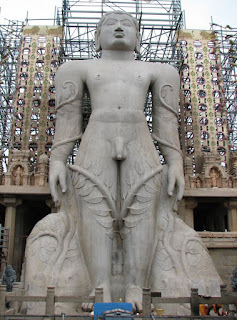 Dedicated to Lord Bahubali, located in Shravanabelagola. 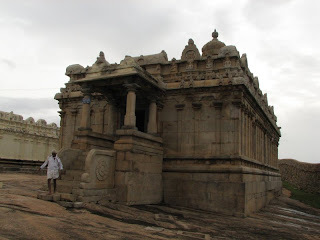 Shravanabelagola is a very important for pilgrimage and religion for centuries. cool, will be going there tomorrow. Very useful description with good photos.Makes one to visit this place. Thanks for the good work. i also waant to go sharavanbelagola.....i m residing in bangalore...from whr i can found bus? Hi there all... I would like to share my trip experience (April 19, 14) been on a 2-day trip. 2 adults 2 kids. Getting dressed in the morning, we reached Majestic just @ 7 AM and were able to catch the bus @ the exit, luckily bus was empty all the same. Fare Adults 141/- & Child 77/- (per person). Made a pit stop just around 9 (believe after Ku-ni-gal). Reached destination at 10:30 AM, bus driver was kind enough to direct us to the nearest Dha ram-sha-la. We checked out 2, With/Without hot water, 200/260 respectively. Kids were fine with cold shower as it was very hot so you know which one we went for. The room was good, nice toilet facilities with cot and bed for 2, and uninterrupted power supply for fan. You can get an extra bed too if need be, chargeable. Since our last visit 15 years back, we had trouble remembering as so much has changed since then, but asking here & there we managed to reach Jain Matt Bhoj-na-la-ya [9 AM - 6:30 PM ] for afternoon food. Though not for my liking it was a peaceful food as I being a Veg, that's a rare even in Pure Veg Hotels in B'lore so far. We loitered around a bit and headed back to our room and slept like logs until 5 PM. In the evening we visited the smaller hill Chan-dra-gi-ri. To my surprise, just at the foot of the hill, you still get to play the slide, which not just me, the kids enjoyed too .. The next day early morning we climbed the main hill. FYI the last bus from Shra-va-na Be-la-go-la to Bangalore leaves at 1 PM & 3 PM, which to my loss found out late. We took the 4:30 Bus to Chan-nara-ya-pat-na and took the connecting bus to Bangalore. At 5:30 we go the Bangalore bound bus (which though every 15-20 mins, all were full to the helm) and then caught up in the Traffic, NH 4. We reached Bangalore @ around 10:15-30 PM. Had we taken the 3 PM bus, the trip could have been truly wonderful experience entirely but the kids loved it, I got back my investment. thanks for sharing your experience in detail ! thanks .. and kindly note that some of the contents here are dated. One major thing is that it takes < 3 hours from Bangalore to get there !